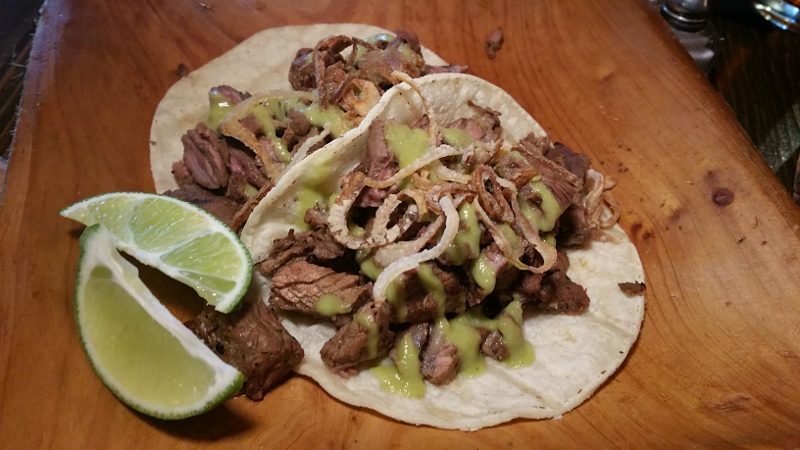 Cocina Condesa – Brightening Up Ventura Blvd. It seems like every time I drive down Ventura Boulevard in Studio City/Sherman Oaks, there is a new restaurant. It is hard to keep up but one of these restaurants caught my eye. With the vibrantly colorful exterior, it is hard to miss Cocina Condesa along Ventura Blvd just east of Colfax. Inside the restaurant is a large open space with long high wooden tables and tall red leather chairs, a full bar along the back wall and tv screens above the bar showing the local sports game. The walls are exposed brick while the ceiling is red. Mexican folk art is displayed throughout the restaurant, as well as accents of color. The loud, casual dining room opens up to an outdoor patio that runs the length of the restaurant. This restaurant screams high energy. 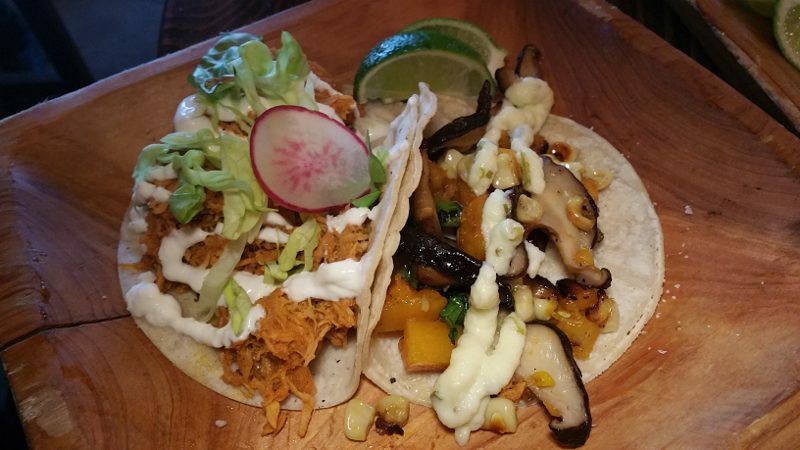 Cocina Condesa features a menu prepared by Executive Chef Eddie Garcia of Mexican street food – tamales, tacos, corn on the cob and more. What that also means is that the menu consists of small plates so it is fun to order a lot of different items for a selection of tastes. I sat down at my table and immediately ordered the guacamole. It is the one thing I cannot avoid on a menu. At Cocina Condesa, they offer a few different types of guacamole, including a spicy one and one with crispy chicharrones. 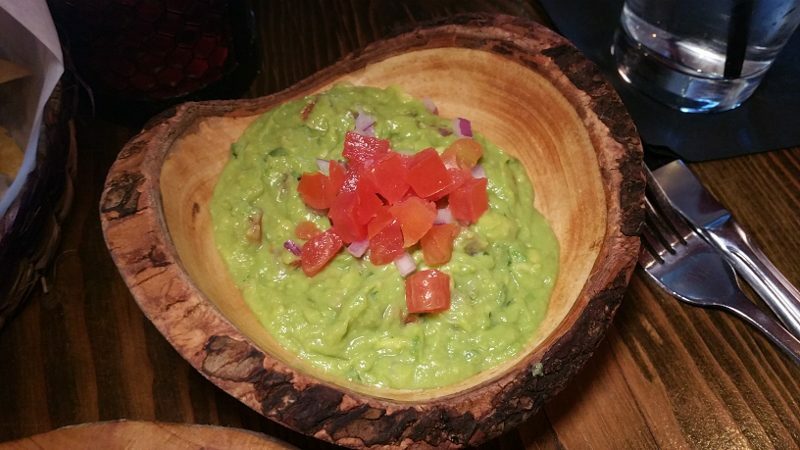 We went with the Condesa House Guacamole made with haas avocados, cilantro, red onion, lime and sea salt. It is fresh and chunky and served in a cool wooden bowl that looks like it was cut straight from a tree. Ceviche de Pescado is made with seasonal fish, lime, red onion, jalapeno, cotija cheese, corn nuts. 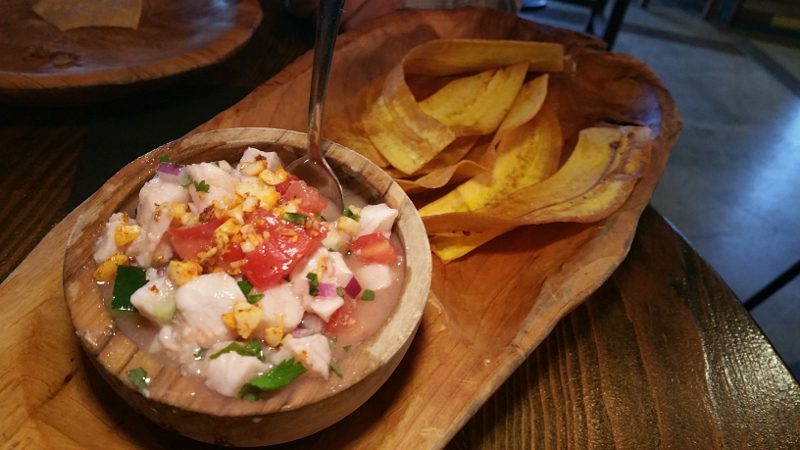 The sweet plantain chips are a nice addition to the tangy ceviche. While Cocina Condesa is a Mezcaleria and has a large selection of tequilas and mezcals, I went with The Bronco. 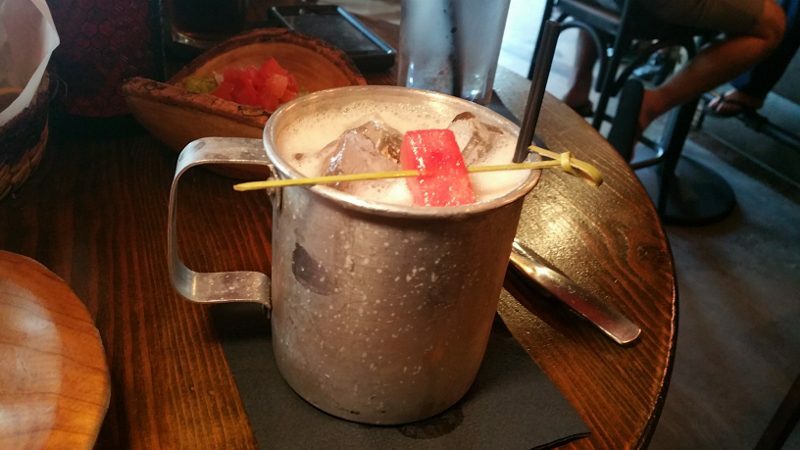 A play on a Moscow Mule, it is made with whiskey, fresh ginger, soda, fresh watermelon juice and fresh lemon juice and served in a copper mug. I liked the play on the spice (from the ginger) and the sweet (from the watermelon). 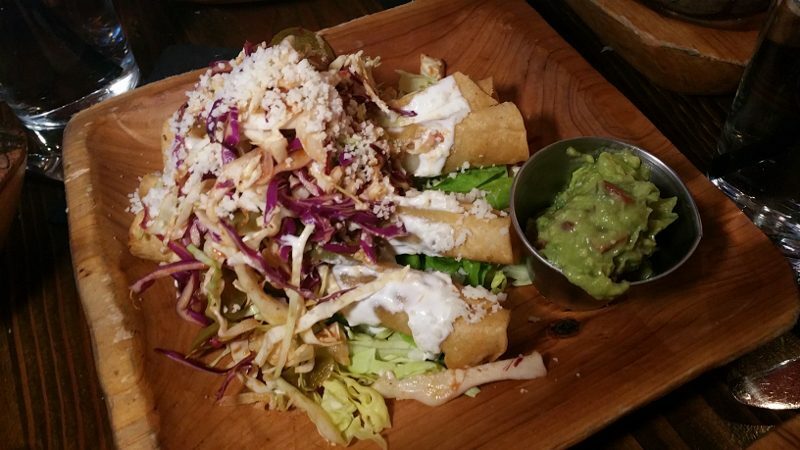 I loved the Brisket Taquitos that are filled with slow braised brisket, spicy slaw, salsa fresca and avocado crema. The Street Corn with the tapatio aioli, cotija cheese, chili and lime is tasty. 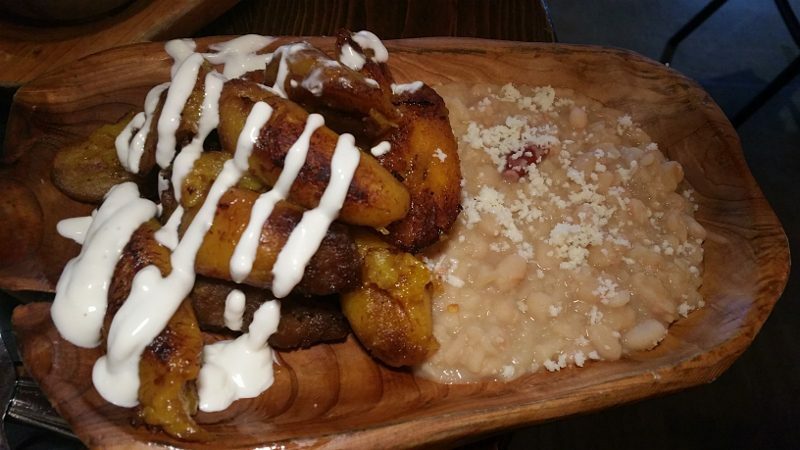 While sweet, the Fried Sweet Plantains with honey lime sour cream and fresh cheese are not desert. They are delicious and served with beans. The sweetness of the plantains is a good compliment to any spicy dish. This entry was posted in Cocktails, Food and tagged Cocina Condesa, Executive Chef Eddie Garcia, Mexican Food, Mexican Street Food, Studio City by Allison Levine.